Darcy Bibb was born in South Korea, but grew up on the island of Maui. 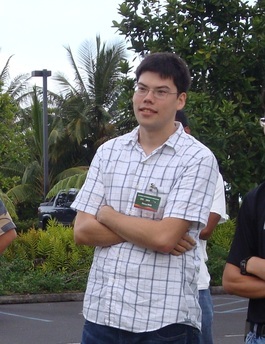 He graduated from Baldwin High School in 2006, and was part of the Electronic and Computer Engineering Technology (ECET) program at Maui CC (now UH Maui College). Darcy earned his BS degree in Electrical Engineering at UH Manoa in Spring 2013, and plans to return to UH to pursue a master’s degree in Electrical Engineering. Since completing Akamai, Darcy earned a master’s in electrical engineering from University of Hawai‘i at Manoa, and now works as an electrical engineer at Raytheon Space and Airborne Systems in El Segundo, CA. Blurring and other effects caused by the turbulent mixing of the Earth’s atmosphere is an important factor in the capabilities of ground-based telescopes. Sonic anemometers provide a means to measure this astronomical seeing. Being able to accurately measure this turbulence allows us to select ideal telescope sites, understand turbulence in the vicinity of a telescope, and possibly predict conditions for telescope observations. A sonic anemometer was used in such a manner during site testing for the Thirty Meter Telescope’s campaign for site selection. However, the data collected from this instrument contains inherent errors due to its design and operation. Aliasing is present in the data due to the nature of digital sampling. Path-averaging errors appear due to measurements of temperature or wind speed within a sonic path of the instrument being averaged along the entire measurement path. Finally, pulse sequence delay errors occur due to the sequential, rather than simultaneous, firing of sonic pulses for measurement of wind speed and temperature. Mathematical corrections to these errors have been published, which were used in development of a program to apply these corrections to anemometer data sets. A five-day period of data was corrected using this program and analyzed to observe the effect of the corrections. We found that there was an average decrease of 16% in the calculated turbulence over this period, and that the magnitude of correction was correlated with the measured wind velocity.